Posted November 7, 2018 at 6:52 pm . 0 comments. Adorama has the Bower 77mm Variable Neutral Density Filter for $18.95. Save 32% from the regular price of $27.95! This filter allows for smooth adjustment between 2 and 8 stops. Adorama is bundling with the Canon EF 100mm f/2.8L Macro IS USM free filters (UV, Circ.Pol and ND2) and other goodies. 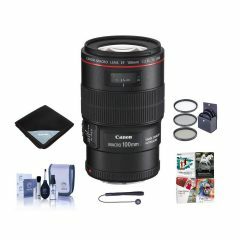 This lens was recently discounted by Canon USA and is available for the lowest price seen yet. If you don’t want the free items, please consider our street price of $669.